Previously: Broken Matt Hardy returned to Impact to save Jeff Hardy from a beat down by The DCC. Also, Rosemary defeated Jade in Six Sides of Steel to win the vacant Knockouts Championship. 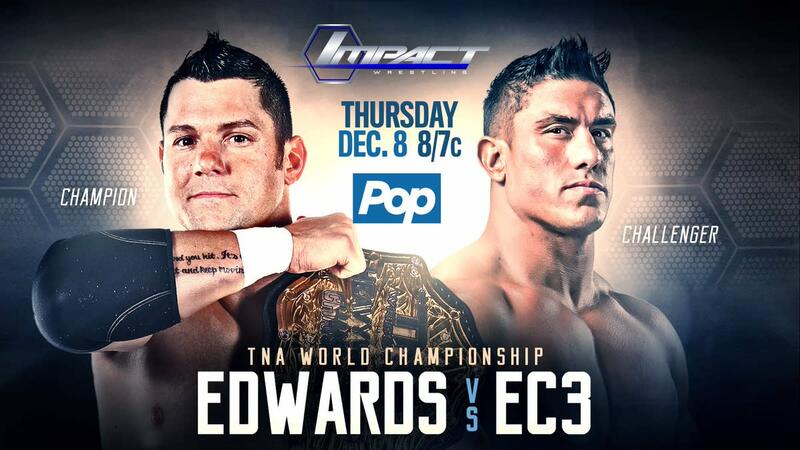 Tonight: Eddie Edwards defends the TNA World Heavyweight Championship against Ethan Carter III in the main event. New Grand Champion Moose is in the ring. He mentions this is his first championship and promised to take on all challengers. The returning Drew Galloway interrupts and reminds Moose that he made it to the finals of the Grand Championship tournament but had to drop out because of an injury. Drew challenges Moose for the title and Moose accepts but Aron Rex interrupts them. Rex says that Moose robbed him of the title and he evokes his rematch clause for a match right now. Rex controlled the first round after he punched Moose with the hand with the rings. All three judges give the first round to Rex. In between rounds, Rex rubbed his hands on his towel. Moose had the early advantage until Rex rubbed his hand in Moose’s eyes, blinding him to gain the advantage. The judges give the second round to Rex as well. Moose hit the Game Changer to win the match 30 seconds into round 3 to retain the title. - In the back, Eddie Edwards promises to retain the title later in his match with EC3. - Backstage, Drew is asked about being passed up for a title shot tonight. He feels TNA should have delayed the Grand Championship Tournament when he was injured and should have givin him a title shot tonight. He promises to win the Grand championship soon. They recap Mandrews turning on DJ Z last week. Mandrews played the heel in this match even though the story of the match was a big guy against a little guy. O’Shea was in control until Mandrews made a comeback and hit a flip dive to the outside. Mandrews won the match with the shooting star press. The rules of the match are that both men must touch all six sides in succession to win. The finish came when Snow and Shera touched five corners, and The Tribunal tried to cut them off, but the faces sent the heels to the outside to touch the sixth corner to win the match. - In the back, EC3 talked about his upcoming title match with Edwards when Eli Drake approached him. EC3 asked Eli to talk but Eli can’t talk for the rest of 2016. - TNA Tag Champions The Hardys, Reby and Maxel come out to the ring. Next week, Matt will present Total Nonstop Deletion, a two-hour edition of Impact all taking place at the Hardy Compound in Cameron, North Carolina. He invites the entire TNA roster and promises Knockout and X Division action. Matt says that Maxel will make his in-ring debut next week, which gets a huge pop from the crowd. The Hardys will defend the tag belts against all teams in an open challenge. Gregory Shane Helms comes out and accepts on behalf of the Helms Dynasty. Decay comes out to accept the challenge as well. Broken Matt gives Helms the Twist of Fate to end the segment. - A video airs from The DCC accepting The Hardys challenge at Total Nonstop Deletion. Before the match, Allie announces she’s been training with Braxton Sutter who comes out in Allie’s corner. Allie and Laurel collided in the ring, which led to Mike Bennett running out and brawling with Sutter to the back. Finsh of the match came when Allie used the reverse DDT to score the win. After the match, Maria tried to jump Allie but Allie caught her and Maria backed off. - In the back, Allie and Sutter celebrated her victory. Allie was so pumped up that she kissed Sutter and quickly left. EC3 gained the early advantage and set up for a TK3 from the top, but Edwards countered into a top rope hurricanrana. EC3 made a brief comeback but Edwards sent him to the outside and a hit his trademark sick suicide dive. EC3 hit a German suplex but Edwards landed on his feet and hit the blue thunder bomb for a close near fall. Edwards hit the Boston Knee Party but EC3 rolled to the outside. Edwards went for a plancha to the outside but EC3 caught him and hit the TK3 on the floor. EC3 locked on a chokehold on Edwards in the center of the ring. Edwards leaned back for the pin, the referee counted three and Edwards tapped out at the same time. The referee awarded the match to Edwards for the successful defense of the gold. After the match, EC3 stormed off while Edwards celebrated. Next Week: It’s Total Nonstop Deletion, which is a special edition of Impact with the entire broadcast talking place at The Hardy Compound. The entire TNA roster is invited to the compound and includes appearances by The DCC, The Helms Dynasty, Decay, Bobby Lashley and Eddie Edwards.